Testicular torsion occurs when the spermatic cord and its contents twists within the tunica vaginalis, compromising the blood supply to the testicle. Testicular torsion is a surgical emergency, as without treatment the affected testicle will infarct within hours. Whilst theoretically it can occur at any age, peak incidence is in neonates and adolescents between the ages of 12-25yrs. Torsion occurs when a mobile testis rotates on the spermatic cord. This leads to reduced arterial blood flow, impaired venous return, venous congestion, resultant oedema and infarction to the testis if not corrected. Males with a horizontal lie to their testes, often termed a ‘bell-clapper deformity’, are more prone to developing testicular torsion. In this anatomical variant, the testis lacks a normal attachment to the tunica vaginalis and is therefore more mobile, increasing the likelihood of it twisting on the cord structures. In neonates the attachment between the scrotum and tunica vaginalis is not fully formed and the entire testis and tunica vaginalis can tort; this is known as ‘extra-vaginal torsion’. It is important to note that this can occur in-utero and new-borns must be thoroughly examined at their first check. Almost all other torsions will be ‘intra-vaginal’, with the freely moving cord and testis torting within the tunica vaginalis. Patients will generally present with sudden onset severe unilateral testicular pain. This is often associated with nausea and vomiting, secondary to the pain. Referred abdominal pain can also occur. On examination, the testis will have a high position* (compared the contralateral side) with a horizontal lie. It can also appear swollen and will be extremely tender. Classically, the cremasteric reflex is absent and pain continues despite elevation of the testicle, termed a negative Prehn’s sign (in epididymo-orchitis, Prehn’s test is often positive but this is an unreliable examination finding). The most common differential to exclude is epididymo-orchitis; this is normally associated with a more gradual onset of pain and can be associated with LUTS and / or pyrexia. Other differentials to consider include trauma, incarcerated inguinal hernia, malignancy, renal colic, hydrocele, idiopathic scrotal oedema, and torsion of the hydatid of Morgagni. The hydatid of Morgagni is a remnant of the Mullerian duct and is a common testicular appendage. This structure can also become torted, presenting with similar sudden onset pain. Torsion of these structures is more common in a younger age group than testicular torsion, and the scrotum is usually less erythematous with a normal lie of the testis. The ‘blue dot’ sign may be present in the upper half of the hemiscrotum, which is the visible infarcted hydatid. The diagnosis of testicular torsion is a clinical one, therefore any suspected cases should be taken straight to theatre for scrotal exploration. 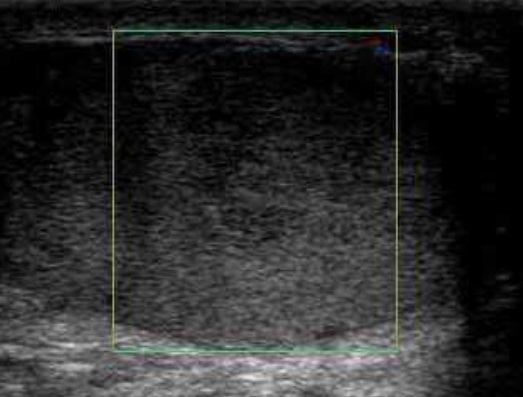 However, in cases with sufficient equipoise, Doppler ultrasound can be used to investigate potential compromised blood flow to the testis (if available, this test has a high sensitivity (89%) and specificity (99%)). A urine dipstick can also be performed to assess for any potential infective component, as part of potential differentials. Testicular torsion is a surgical emergency with a 4-6hrs window from the onset of symptoms to salvage the testis before significant ischaemic damage occurs. Any suspected case warrants urgent surgical exploration of the testis to assess the testes and the spermatic cord for evidence of torsion. Patients should be provided with suitable strong analgesia and anti-emetics pre-operatively, and made nil by mouth with maintenance fluids prescribed. If torsion is confirmed intra-operatively, the cord and testis will be untwisted and both testicles fixed to the scrotum, termed bilateral orchidopexy (prevent further any further torsion episodes). In cases where the testis is non-viable, an orchidectomy may be warranted; prosthesis can be inserted at time of surgery or at a later date, at the patient request. Delay in surgical exploration leading to prolonged ischaemia can result in testicular infarction; the chance of this happening increases exponentially with time since onset of pain*. Despite expedient scrotal exploration, de-torsion, and orchidopexy, the affected testis may later undergo atrophy. Patients undergoing scrotal exploration should be consented for chronic pain, palpable suture, risk to future fertility, and a theoretical risk of future torsion despite fixation. Which of the following is a risk factor for testicular torsion? What pathology does the ‘blue dot’ sign classically suggest? By what time frame does a testicular torsion needed to be operated on from onset to prevent irreversible damage?